Quick quiz, what finch has a white collar all the way around the neck? Take a minute to think it over as you stare at this picture I took this morning. Can you name that species? Go ahead, look it up. I can wait. This would have been a good bird to have show up last month when I wrote a post on partial leucism. This is simply a humble female purple finch though this individual is sporting a unique white collar to catch a guy's eye. Just wait, white collars on finches will be all the rage this spring season. Seriously though, this bird may be lucky to survive to next season. That white on the back of the head is like a bulls eye for the sharp-shinned hawk that hunts the feeding station. 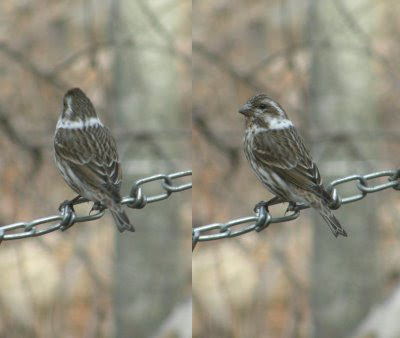 Here's a photo of a normal female purple finch for comparison. The white in the unique individual in the first photo is the result of a lack of pigmentation in a group of feathers. It sure gave me pause when I saw it the first time. Too bad the purple finches will migrate away soon. It would be fun to keep track of this individual.